June 26, 2009: The crew of the International Space Station (ISS) is about to get a new "eye-pod." 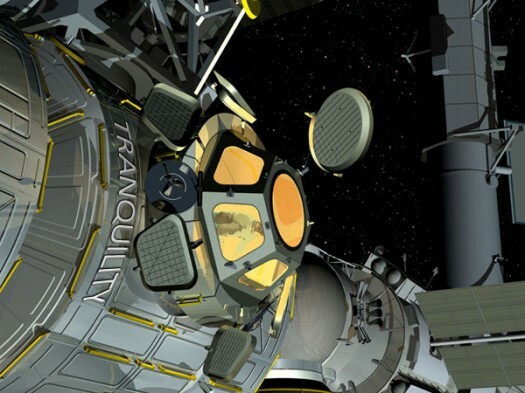 The Tranquility node headed for the space station early in 2010 will feature a viewing dome unlike any other window ever flown in space. The dome, called the Cupola, is literally studded with windows for observing Earth, space, and the marvelous expanse of the ISS itself. The Cupola, named after the raised observation deck on a railroad caboose, is designed as an observation platform for operations outside the station--e.g., robotics, spacewalks, and docking spacecraft. Computer workstations inside the dome will give astronauts full control over the space station's robotic arm and dexterous manipulator, while the windows offer unparalleled views of these devices in action. It's also a place where astronauts can unwind. "Crews tell us that Earth gazing is important to them," says Julie Robinson, the ISS Program Scientist at NASA's Johnson Space Center. "The astronauts work hard up there and are away from their families for a long time. Observing the Earth and the stars helps relax and inspire them." Until now, space station astronauts have been confined to looking out small portholes or at best the 20-inch window in the US Destiny Laboratory. The Cupola will dramatically expand their view. "The Cupola's 80-cm diameter circular top window is the largest window ever built for space," says Robinson. "Rather than peering through a little porthole, the Cupola will allow a stunning look at the cosmos and unprecedented panoramic views of Earth. Astronauts will share these views with the world through photographs taken through the windows and posted online." "By photographing oblique views with different sun angles, the astronauts can use the Cupola to give scientists a view of the Earth that is not available from satellites," she adds. Astronaut photographs of Earth have been used to understand Earth processes such as melting of icebergs, noctilucent clouds, dust storms, and the structure of hurricane eyes. "Suddenly, from behind the rim of the moon, in long, slow-motion moments of immense majesty, there emerges a sparkling blue and white jewel, a light, delicate sky-blue sphere laced with slowly swirling veils of white, rising gradually like a small pearl in a thick sea of black mystery. It takes more than a moment to fully realize this is Earth . . . home." From the Cupola, it's going to look better than ever. The Cupola is now at Kennedy Space Center waiting for final integration on the Node-3 (Tranquility) axial hatch and closeout for flight. With the launch date set by NASA for February 2010 on Space Shuttle Endeavour, Node-3/Cupola should be integrated in the Shuttle cargo bay by the end of 2009. The Node 3 connecting module, built by prime contractor Thales Alenia Space in Turin, Italy, is the last element of a barter agreement by which ESA supplied NASA with ISS hardware, including the Cupola and two Node modules (Node 2 and 3).